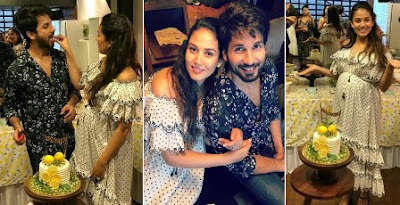 Actor #ShahidKapoor and #MiraRajput are expecting their second child together and “Udta Punjab” actor arranged an epic baby shower for lovely wife Mira. Shahid Kapoor and Mira Rajput are all set to welcome their second child in a few months. Papa Shahid arranged a baby shower for Mira at their residence. The pictures of the baby shower went viral. The actor took to his social media profile and shared a candid and lovely picture with wife Mira. In the photo, Mira is glowing with pregnancy and Shahid can’t contain his happiness. The couple also hosted a cake cutting ceremony. The couple recently announced the arrival of their second child in the cutest way possible. The couple announced Mira’s second pregnancy through an adorable Instagram post that had Misha alongside a sketch of balloons that read, “Big Sister”. The couple welcomed their first child on August 26, 2016 and named her Misha which is an amalgamation of Mira and Shahid. On the work front, Shahid Kapoor is currently busy wrapping “Batti Gul Meter Chalu” opposite Shraddha Kapoor and Yami Gautam. The film is helmed by Shree Narayan Singh and tackles the power (electricity) issue in India.